To achieve increased productivity, competitive advantage, and profitability, high value-creating businesses around the world have consistently turned to "lean thinking" for solutions. Manufacturing processes have widely adopted lean production systems to gain improved operational effectiveness and the lowering of costs. Most recently, the "lean thinking" wave has been advanced to better identify and understand the expectations of consumers, i.e. lean consumption. 1. Solve the customer's problem completely, by insuring that everything works the first time. 2. Don't waste the consumer's time. 3. Provide exactly what the customer wants. 4. Provide value where the customer wants. 5. Provide value when the customer wants. 6. Reduce the number of problems customers need to solve. The baseline essence of value creation is the successful matching and synchronization of customer wants with business process capabilities. Intuitively, everything done in business should be system-oriented and designed to create value via some process of transforming inputs into outputs. 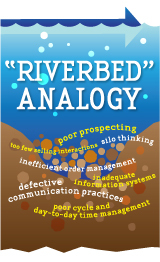 The problem is that the traditional selling process in terms of overall productivity isn't functioning very effectively. How is it that the essential linkage between widely understood lean production processes and lean consumption processes is in such productivity disarray? Regardless of the core problem or reason, a door of significant opportunity is open for lean thinking applications in every sales-driven organization. The long-term solution to poor sales productivity can be summarized in one concept - the consistent elimination of sales process waste. Waste is essentially any process activity that fails to add customer value, which, as previously noted, is being progressively "lean" defined. In summary, much has been written about how to achieve sales productivity gains, yet relatively little overall improvement has been achieved. The average salesperson continues to spend the majority of his/her time in unproductive and wasteful non-selling activities. Insanity has been defined as continuing to do something that is not working. Producers and customers alike are demanding change to a lean approach to doing business and sales must reengineer to become properly aligned with today's market demands. Sustainable productivity gains will only be achieved through initiatives that drive the continuous and systematic removal of waste, specifically designed to help sales processes work smarter, work faster, and do it right the first time. A lean-thinking approach is the right productivity solution and now is the right time. Womack, James P. and Jones, Daniel T. (2005), "Lean Consumption," Harvard Business Review (March) pp 58-68. After 33 years in sales with an emphasis on financial services, Professor Fifield has spent eight years teaching undergraduate and graduate courses including Professional Selling and Communications, Negotiations and Conflict Resolution, and Operations Management. He serves as the coach for the Baylor Sales Team and coordinates the Music and Entertainment Marketing Degree. He holds an MBA in Finance and International Business from the Kellogg School of Management at Northwestern University and a BBA in economics from Southern Methodist University.